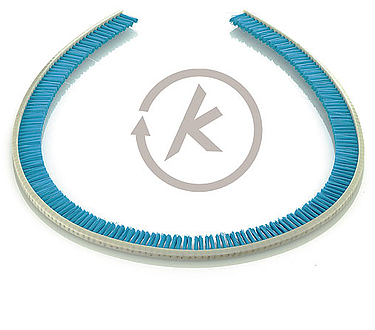 For this brush type we use standardised vee-belt profiles, made of polyester elastomers and immune to moisture, oil and grease as well as resistant to numerous chemicals. Therefore an application is possible in a temperature range from -15°C to +80°C. They can be produced in all lenghts requested, open ended or endless closed belt. Mainly natural hairs and bristles, plant fibres and synthetic bristles (PA, PP, etc.) are used, so all kinds of brush surface - from very soft to very hard - can be obtained according to the material quality chosen. For the endless vee-belt brushes you normally have to use a belt pre-tension of 3% of the distance between the pulleys (a). In order to obtain this we recommend that an adjustment device (such as a slot) is used with an adjustment range of 5% of the distance between the pulleys (a). You can use standardised drive pulleys to drive the belt brushes.Please ensure the diameters of the deflection pulleys are correct in order to obtain an adequate looping of the belt. The limiting values of the smallest possible pulley diameter are aligned to the lateral cut of the vee belt standard profiles.